Features: Easy to setup and use: Place your phone on the wireless charger pad and automatically begins charging, make sure that your smartphone's receiver is aligned with the charging area.It charges your cell phone without plugging a wire into your phone, which better protects your phone from damage due to over-plug-in-and-out. [SLIM] : Design of 8.4mm thickness, generate less heat and have more efficient charging, small and convenient, you could use it at desk,room,office,school and anywhere. 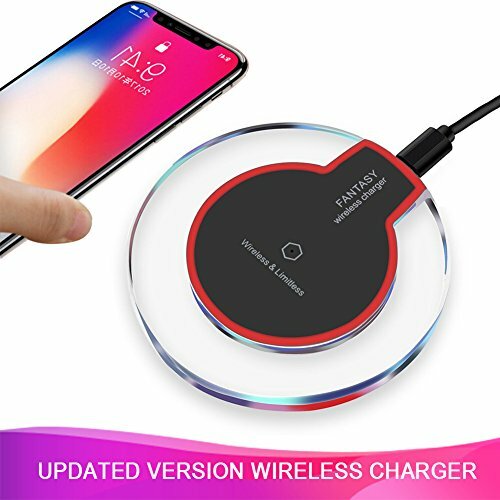 [VERTICALLY HORIZONTALLY CHARGING] : Easily answer emails, text messages, receive calls and whatever else you might need to do at office while your phone is charging on wireless charging pad stand.